Pride of Ownership shines in this beautiful 3 bedroom 2 bath home with 2360 square feet all on one level in the highly desired Hastings Farms subdivision! Your new home features 10′ Ceilings, Great Room & Den / Office that currently being used as a Game Room! Your kitchen features a ton of cabinet space & well appointed Stainless Steel appliances including Double Oven/ Built-In Microwave, Gas Stove & Dishwasher. 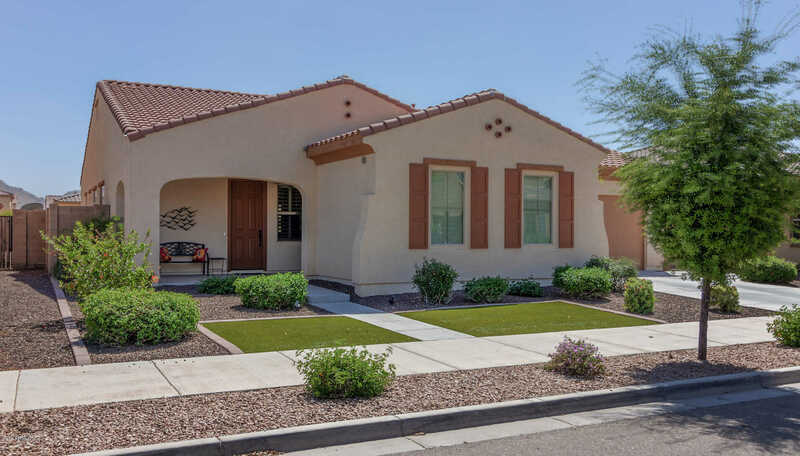 Open up your 3 Panel Sliding Glass Wall welcoming you to a Custom Designed yard with large covered patio, sparkling pebble Tec Play Pool with water feature & low maintenance Desert Landscaping with Synthetic Grass in front and Back!. Come take a look, you won’t be disappointed! Directions: South to Via de Palmas, East to 209th, South to Via de Arboles and East to your new home on the South side of the street! Please, send me more information on this property: MLS# 5911615 – $374,900 – 20933 E Via De Arboles --, Queen Creek, AZ 85142. I would like to schedule a private showing for this property: MLS# 5911615 – $374,900 – 20933 E Via De Arboles --, Queen Creek, AZ 85142.